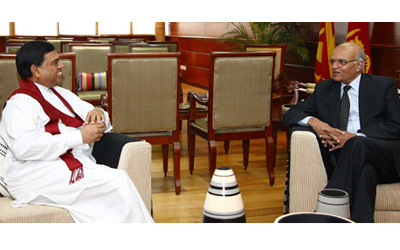 India’s National Security Advisor Shiv Shankar Menon called on Senior Adviser to the President and Economic Development Minister Basil Rajapaksa at the Economic Development Ministry yesterday. They discussed a range of issues of bilateral importance and reiterated their commitment to strengthening the strong and abiding friendship between India and Sri Lanka. Prior to Shiv Shankar Menon’s arrival Minister Basil Rajapaksa paid an official visit to India as President Mahinda Rajapaksa’s special envoy. During this visit Minister Rajapaksa held discussions with Indian Minister of External Affairs Salman Kurshid and National Security Advisor Shiv Shankar Menon. The latter arrived in the Island following an invitation extended to him by Sri Lanka’s Ministry of External Affairs. The Indian official also met President Mahinda Rajapaksa, Defense and Urban Development Ministry Secretary Gotabhaya Rajapaksa and other top officials for discussions on the Tri -lateral Maritime Security Treaty between India, Sri Lanka and the Maldives.